Stephen L. Nelson, MBA, CPA provides accounting, business advisory, tax planning, and tax preparation services to small businesses. He belongs to the American Institute of CPAs and holds an MBA in Finance and a Masters in Taxation. His 100-plus books have sold more than four million copies. Part I :Quickly into QuickBooks. Chapter 1: QuickBooks: The Heart of Your Business. Chapter 2: Answering Mr. Wizard. Chapter 3: Populating QuickBooks Lists. Part II: Daily Entry Tasks. Chapter 4: Creating Invoices and Credit Memos. Chapter 5: Reeling In the Dough. Chapter 6: Paying the Bills. Chapter 8: Keeping Your Checkbook. Chapter 9: Paying with Plastic. Part III: Stuff You Do from Time to Time. Chapter 12: Building the Perfect Budget. Chapter 13: Online with QuickBooks. Chapter 14: The Balancing Act. Chapter 15: Reporting on the State of Affairs. Chapter 16: Job Estimating, Billing, and Tracking. Chapter 17: File Management Tips. Chapter 18: Fixed Assets and Vehicle Lists. Chapter 19: (Almost) Ten Tips for Business Owners. Chapter 20: Tips for Handling (Almost) Ten Tricky Situations. Chapter 21: (Almost) Ten Secret Business Formulas. Appendix A: Installing QuickBooks in Ten Easy Steps. Appendix B: If Numbers Are Your Friends. Appendix C: Sharing QuickBooks Files. 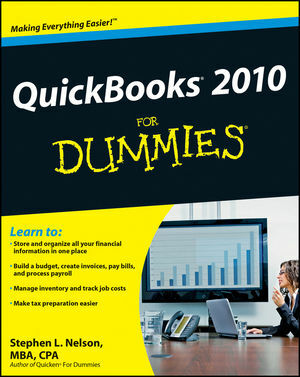 Seattle CPA and long-term Dummies author Stephen L. Nelson has written more than 150 books including the Dummies best-sellers Quicken For Dummies and QuickBooks For Dummies. Nelson also publishes the www.llcsexplained.com and www.scorporationsexplained.com websites.